“Seattle Times photographer looked into souls,” by Jack Broom, Seattle Times staff reporter (The Seattle Times, Thursday, July 7, 2005). View a selection of Jimi Lott’s photographs. Photojournalist Jimi Lott was known for his care for the less fortunate and for his visual sense of humor. He died in 2005 at age 52. His death was ruled a suicide. “Stories about the down-and-out — the poor, the homeless, the mentally ill — were closest to Jimi’s heart,” said Seattle Times Metro Editor Jim Simon, who, as a reporter in the late 1980s, worked with Mr. Lott on a series about the state’s troubled mental-health system. Lott’s honors for the series included the 1989 Cowles Cup, named for William Hutchison Cowles, former publisher of The Spokesman-Review. 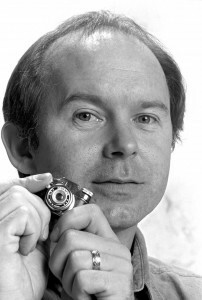 For four consecutive years (1985-88), Lott won the Reid Blackburn Memorial Award for outstanding achievement in feature photography. The award, part of the annual Associated Press Northwest Photography Contest, is in memory of Reid Blackburn, a 27-year-old photographer for The (Vancouver, Wash.) Columbian killed in the May 18, 1980, eruption of Mount St. Helens. Lott was photographer on the investigative team whose coverage of safety problems with the rudders on Boeing’s 737 jetliners won a Pulitzer Prize in 1997. He won 18 awards in the Pacific Northwest Excellence in Journalism Contest of the Society of Professional Journalists, Sigma Delta Chi; 10 awards in the annual Associated Press Northwest Photography Contest; and first place in the feature category in a 1992 state photojournalism contest for prep sports. In 1988, he won several honors in the 45th annual Pictures of the Year competition at the University of Missouri, including a first place in news-picture story for his photographs in a special section on the homeless and an award of excellence for a feature-picture story on cowboys. Before coming to The Seattle Times, Lott was a 1984 finalist for a Pulitzer Prize in spot-news photography at The Spokesman-Review for a photograph of a young boy being comforted by a firefighter after an apartment-house fire. Porter said Lott sometimes gave money or toys to needy people he would encounter on his assignments, and he built computers to give to those in need. After his death, professional colleagues held silent print auctions and gathered donations to establish the annual NPPF scholarship in his name. Jimi Lott was born in Pontiac, Mich., and raised in San Diego. In the early 1970s, Mr. Lott attended San Diego City College and Southwest Oregon Community College, getting his first photo job in 1972 at The World in Coos Bay, Ore., where he later worked at the Bay Reporter. In the late 1970s and early 1980s, he worked as director of photography at the Skagit Valley Herald in Mount Vernon and then the Yakima Herald-Republic. In 1982, he went to The Spokesman-Review, where he was chief photographer before coming to The Seattle Times two years later. He left the newspaper in 2004 to pursue work in photo illustration. Away from work, Lott’s interests included music, particularly rock. Copyright 2005, Seattle Times. Used with permission.